Hello! I am LOL_Luke_LIVE, and I like to play video games. I play Xbox. I am DeepLake437 on Xbox. I am LOL_Luke_Live on Twitch. Please feel free to follow me! I would love to become a popular Twitch streamer, it has been a dream of mine ever since I started watching Dr. DisRespect. 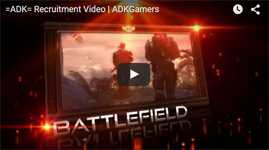 I hope that joining =ADK= Gaming will help me on my journey! Welcome! The majority of the community plays on PC. You have a PC? I do not have a PC... at this time. I might work up to a PC, though! Thanks! I am filling out the application forum now. So, do I have to wait for someone to accept my application form, or am I automatically a part of ADK now? @LOL_Luke_LIVEAfter you apply, you will need to get in discord and chat with some people. Once someone gets a feel for you they will give you a vouch. Okay, what is the discord link? Also, thanks for the help! So, am I a member, or do I still need to get a Vouch? Thanks for all of the support, guys!